June 2, 2018: I love the look of the hickory hardwood floor but, it will need some protection in the high traffic areas. The most high traffic area of the house is the dining room looking out the patio doors at the live entertainment provided by the local wild life. 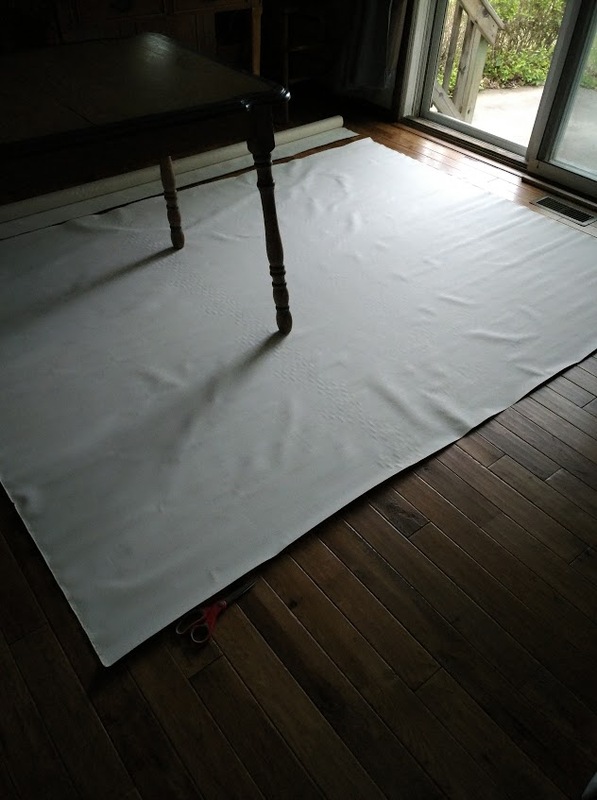 To provide that protection I decided on a painted canvas floor cloth. I purchased the canvas from Wholesale Arts and Frames 6839 Lankershim Blvd. North Hollywood, CA 91602 818 255-1400. info@wholesaleartsframes.com It is a presized cotton canvas normally used for stage screens. I needed the 96" width to cover the space needed to protect the floor from scraping chairs. 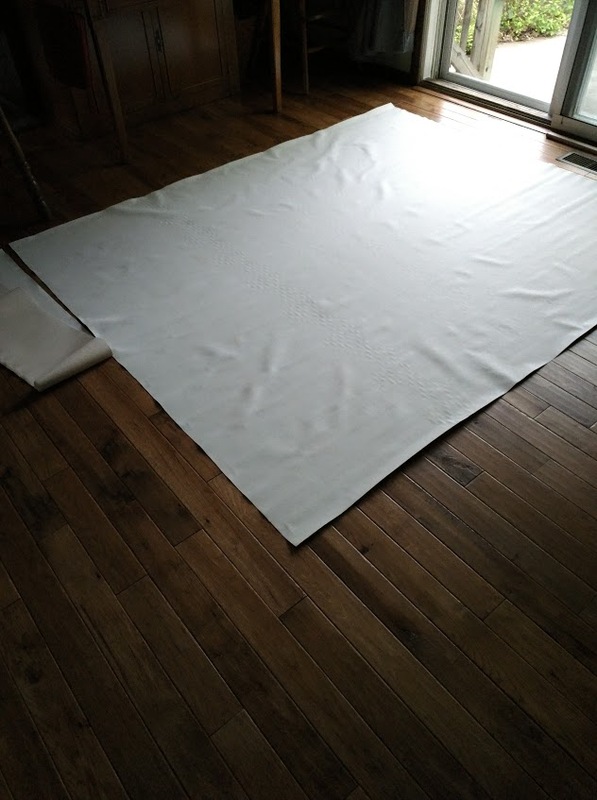 Sail canvas only came 60" wide. There was 6 yards on the roll in the photograph. It looks like I may have an opportunity to do more than one floor cloth. I will let you know latter if there will be one floor cloth for each season. 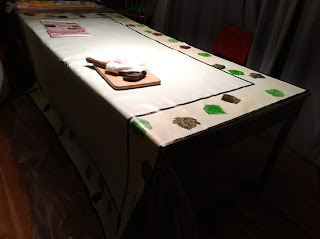 The width and length of the floor cloth was eyeballed and the roll was used as a straight edge to pencil mark the cut. 8" was marked from the selvage edge and cut off. All the online instructions said to turn over the edge one time and top stitch. This was not fun because the prefinish and weight of the canvas made it stiff. The pressure foot was not able to keep the fabric under control. 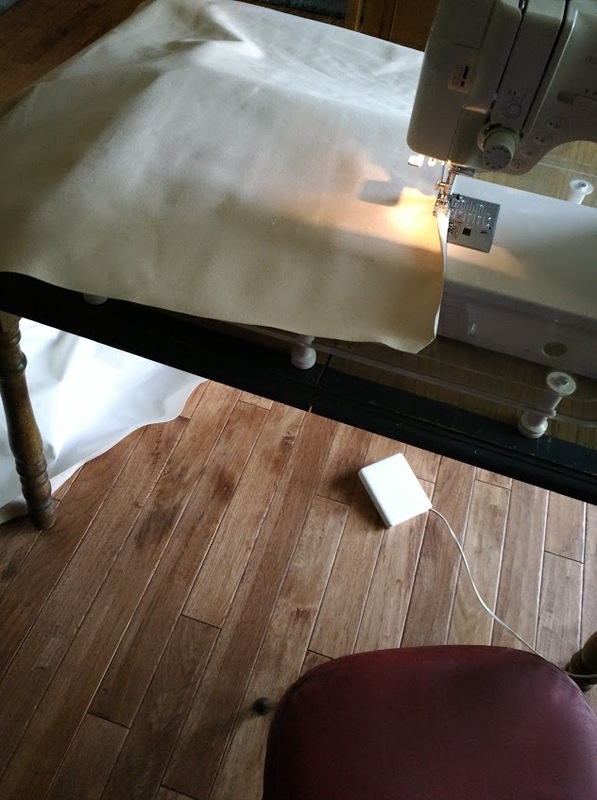 I had to ssssllloooooooooooowwwwwwwwwwwllllllyyyyyyyyy sew, supporting the fabric to keep it from sliding out from under the pressure foot. Two coats of the base paint left over from the walls of the dining room were applied to the canvas. I used package tape to attach a 2" paint brush to a broom stick. It was braced by two wooded spoons from my kitchen. Low tech is a good thing. 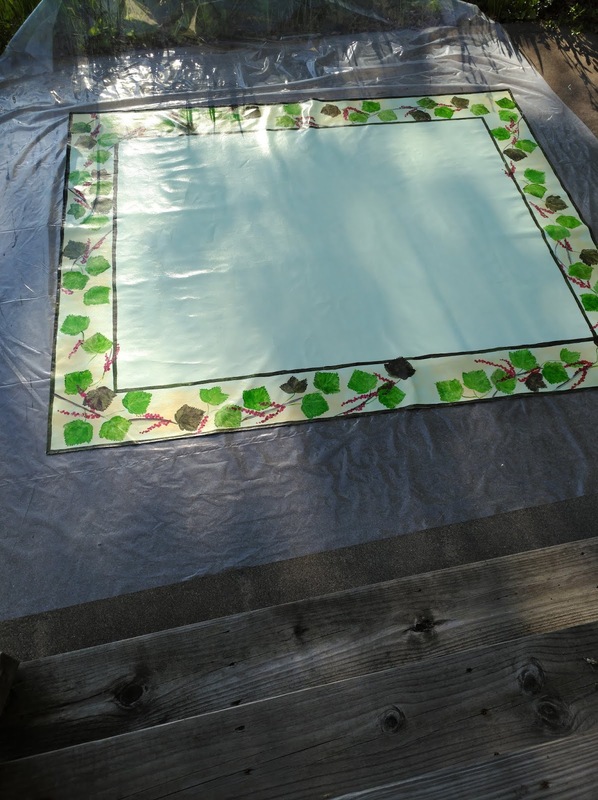 A cheap plastic paint cloth kept the canvas from picking up dirt from the concrete patio. 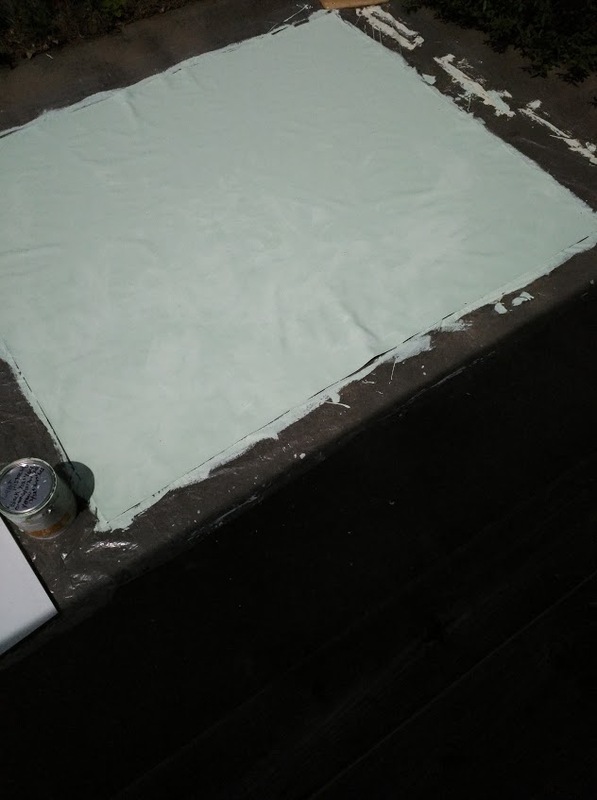 The mint green is leftover paint from the walls of the dining room and kitchen. There were a couple hours of drying time between coats. 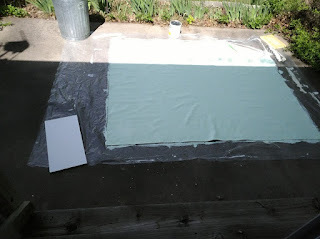 After the canvas was dry I loosely rolled the canvas, covering the beginning edge of the roll with the plastic to make sure the paint would not end up sticking to itself. I brought the loose roll into the house anticipating overnight rain. June 4, 2018: The plan is to put an 8" border around the floor cloth of currants on stems with leaves. The border was described on the canvas in pencil. It will be covered later with a 3/4" wide lattice. For the background of the border I rag painted golden rod over the green to soften the background. 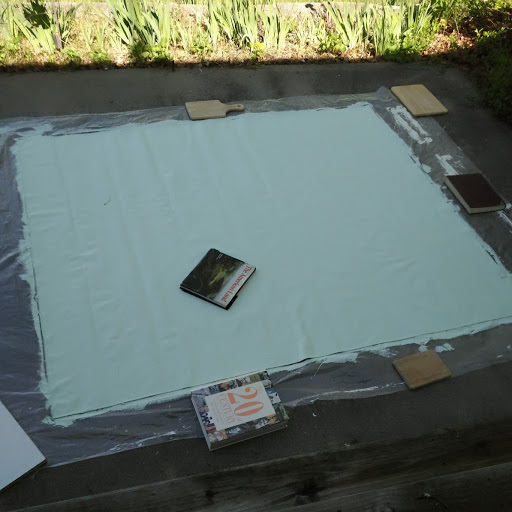 It was a windy day so heavy books were used to hold down the canvas while it dried. I left the canvas outdoors until it was dry to the touch. 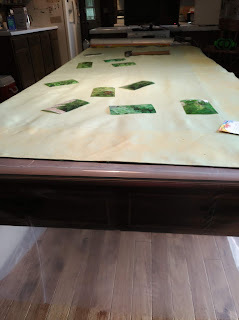 Then I moved it indoors to continue drying flat, undisturbed because we were returning to the other house and did not need to use the floor space. 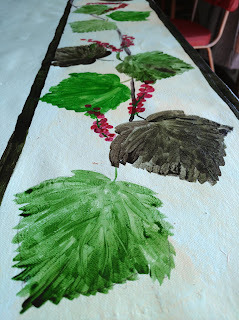 Now I have to check the basement of the other house for leftover paint from other projects to use to paint the currants and leaves. You may be wondering why the canvas is being painted outside on the patio instead of in the basement or garage. There are actually four reasons. 1- the basement does not have the wonderful ventilation of the outdoors. 2- The patio door is a lot easier to navigate than the 12 steps with two sharp turns into the basement. 3- The garage is almost a football field away from the house, down a gravel and sand drive way. Transporting the canvas un-damaged that distance would be tricky. 4 - There are all kinds of woodland creatures that like to visit the garage. This last week is was a skink. (not a skunk, although there are some around) Mice, chipmunks, snakes and insects I do not recognize all like to visit the garage. I don't want to chance one of them chewing or what ever on my floor cloth causing damage. June 16, 2018: Last week I stayed in SE Wisconsin while my husband and son did projects on the retirement house. Almost 2 weeks of drying time. 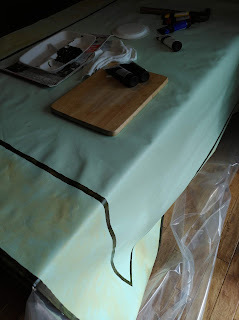 The small table was moved out of the way and the telescoping dinner table was pulled out and covered with new plastic tarp for the next steps of this project. All 7 leaves were needed. I have a collection of photos taken of the currants from blossom to berry from past years. They were printed up and spread on the floor cloth for reference. The paint is artist's acrylic in tubes, purchased for the project. 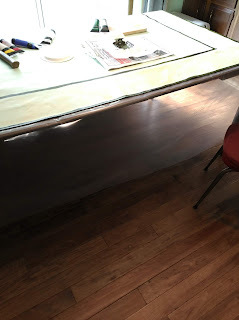 I did check in the basement for paints from other projects and decided not to go that direction. There were too many bases in enamel and oil. Many were dried out. 4 colors were used: White, red, brown and green. The brushes came in a pack with chisel point and fine points. 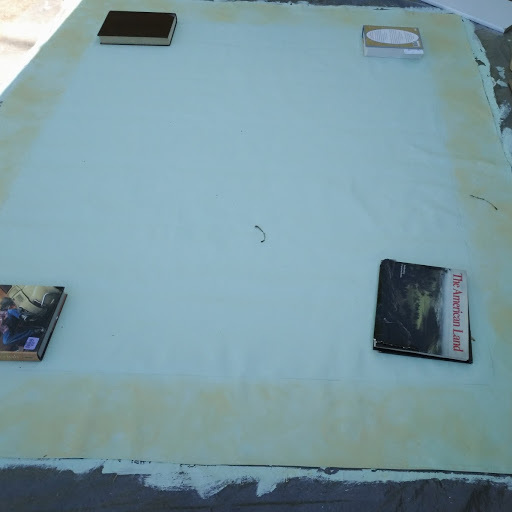 The lack of friction of the plastic tarp and the weight of the canvas required weights be used to keep the painting in place. Note the hammer and bread board. Polystyrene compartmentalized trays left over from some event years ago were used as my pallet. An empty spice jar was used to hold water. The lines of the border were painted using a blending of the brown and green. The lines are not precise. I've never been accused of coloring between the lines. 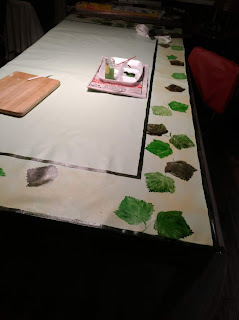 The small paper plates were used for templates to outline the shape of the leaves in pencil on the canvas before I began painting. There were two sizes of templates used. June 17, 2018: Color... The leaves were filled in color by color. There were 3 rounds of the border, starting with the brown. June 18, 2018: Here is the 3rd round of leaves with stems added. A few rustic bush branches were added in brown and white. This pulled the floating leaves together. 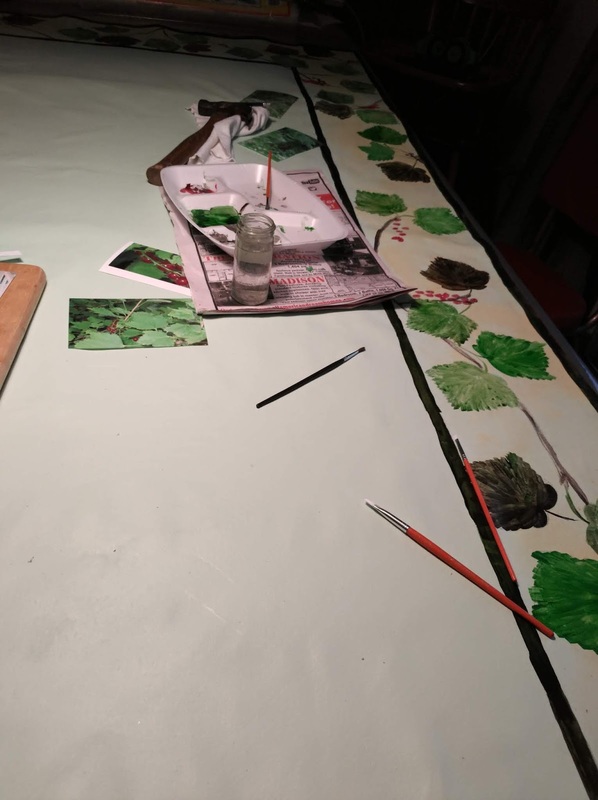 Painting the berries began using a darkened red to define the strands, followed by the pure red of the berries. There is no reason to stay within the lines of the border with the leaves and berries. And... the green stems were added to the strands. June 19, 2018: This is the canvas drying after the 3rd layer of water based polyurethane. (1 quart) This time I found a roller, cover and extension stick in the basement. 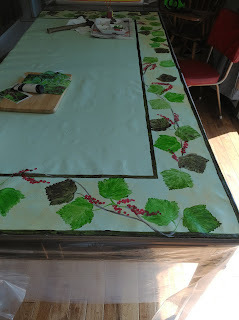 It was brought into the house once dry to the touch to set completely while we packed up and came back to SE Wisconsin. 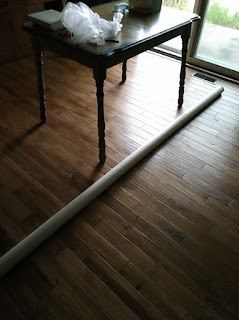 On Friday it will be put in place under the table and chairs, ready for the first spill to be wiped up. 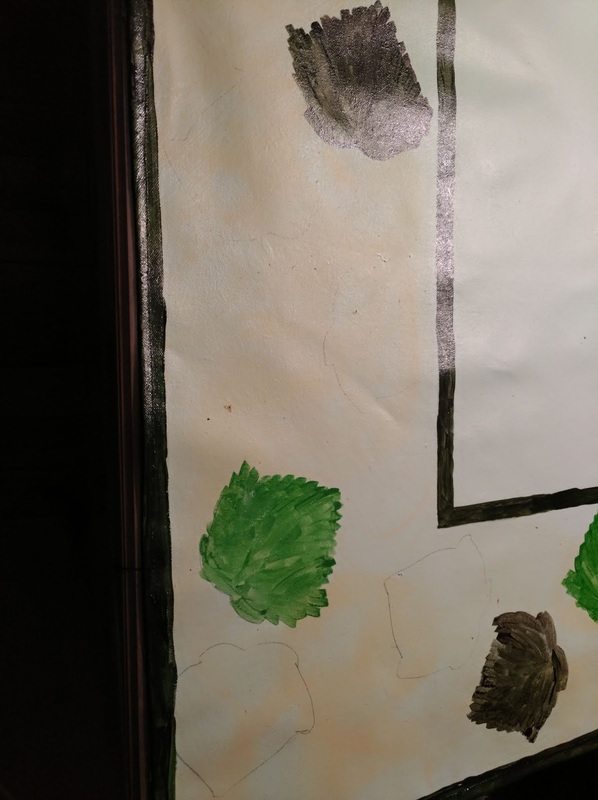 Note the difference between the canvas in detail and in it's entirety? I am an impressionist at heart with a love of the work that catches the feel of the subject.